Kirkland Seventh-day Adventist School prepares students to be life-long learners, critical thinkers, and tomorrow’s leaders. 7th and 8th Grade spent time at WWU's Marine Biology Station. 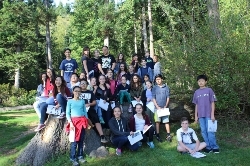 KSDA's 7th and 8th grade students spent a day having school outside at WWU's Marine Biology Station. Mr. Andrew Rice taught classes that allowed students to dissect flowers, collect algae, and identify native plants. Evenings were spent enjoying singing by the campfire and playing games in the lodge. The final event was "The Amazing Race Rosario Style" which was organized by Mrs. Taber. Students raced to complete crazy events to claim the title of champions.